These delicious and fragrant Matcha Green Tea Sugar Cookies are a sophisticated twist on the classic sugar cookie recipe. Did you know that you can make delicious fragrant sugar cookies by adding matcha powder to your recipe? It’s also a perfect way to add green colour to your Christmas baked goods without using any artificial colours. And adding matcha powder to sugar cookies is a great way of adding anti-oxidants to a recipe that would otherwise be devoid of any! These Matcha Green Tea Sugar Cookies are easy to make, buttery, perfectly sweetened and tender. 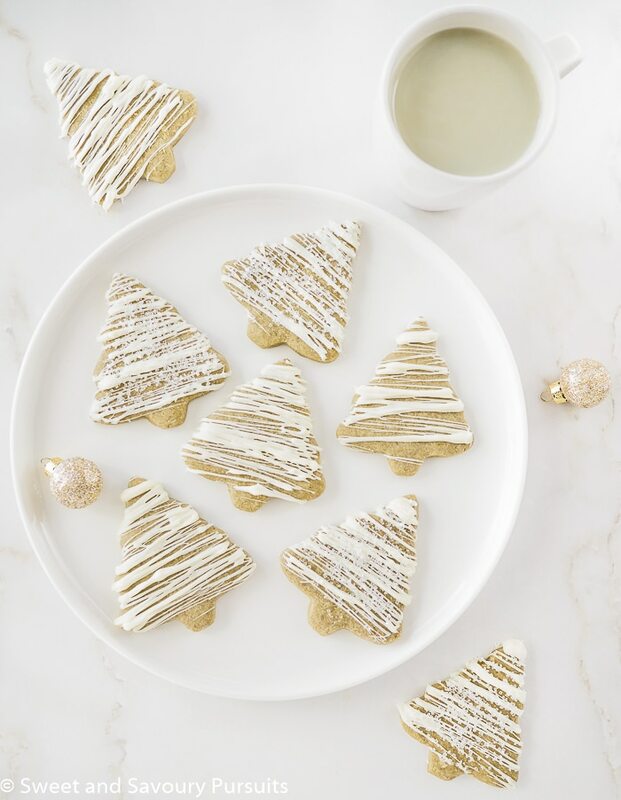 I find that white chocolate pairs wonderfully with matcha and so I dressed up these sugar cookies with a white chocolate drizzle and added a bit of coarse sugar to some. So if you’re looking for a more complex and adult flavoured sugar cookie, then consider these Matcha Green Tea Sugar Cookies as an option. 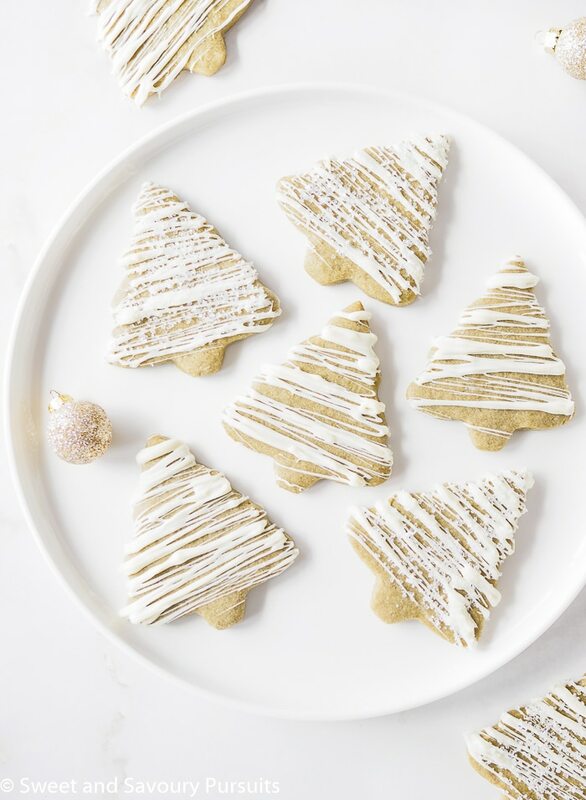 And they’re not only for adults, my children loved them so these sugar cookies are a delicious treat that everyone will enjoy! In a bowl, combine the flour, matcha powder, baking powder, and salt. Whisk until blended and set aside. Add the sugar and continue beating for 2 to 3 minutes more, making sure to scrape the bottom and sides of the bowl once or twice. Add the egg, vanilla, and almond extract, beat well. Stop the mixer and scrape the bowl. Mixing on low speed, slowly add the flour mixture and mix until well blended. Remove the dough and shape into 2 disks about an inch thick. Wrap the dough in plastic wrap and refrigerate for at least an hour and up to 2 days maximum. Roll the dough out to about 1/4 inch thickness, if dough is sticky you may want to dust your surface with a little bit of flour or icing sugar. Bake in the oven for 8 to 11 minutes, rotating sheet halfway through the baking time. Bake until cookies look set and are slightly golden underneath. Working with half the chocolate chips at a time, melt in the microwave in 25 seconds increments. Pour the chocolate into a pastry bag (with Wilton tip #233) or small plastic bag (cut off a very tiny corner). Starting from right above the cookie and moving your wrist quickly, drizzle the chocolate onto the cookies. If desired add coarse sugar or sprinkles while chocolate is still wet. If you prefer softer cookies, bake the cookies for the least amount of time necessary. Yum! 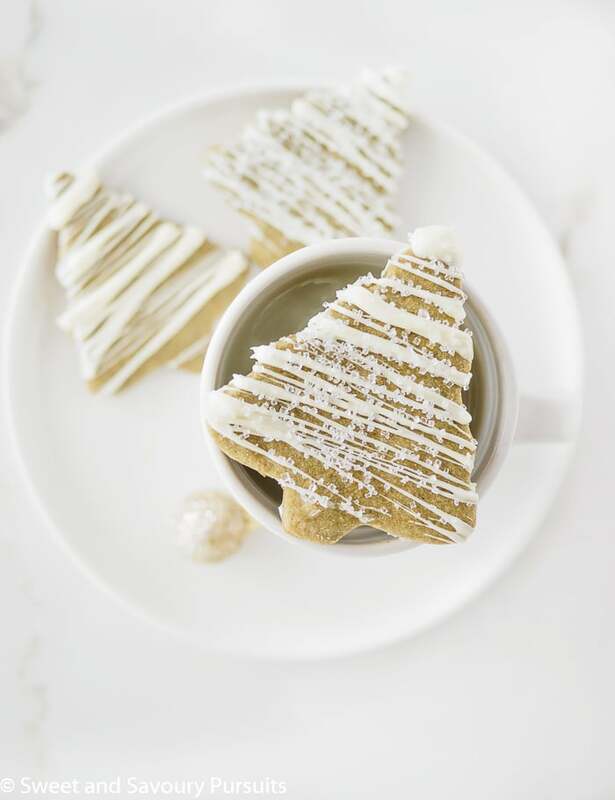 I love a good sugar cookie, even if my drizzle won’t look half as good! Would pair perfectly with a matcha latte. Thanks Rob, they would be delicious with a matcha latte! Wow. My kids love matcha and cookies. This recipe’s really perfect. I will make it today. Thank you for your sharing, Fida :). Hi Emma, I hope you and your kids will love them as much as we do! Thank you Myrna, can’t wait for you to try them too!